When generating Flexcel reports with the registered version, I get an error similar to: "This document was created with the non-commercial version of FlexCel...."
If there is a trial dll in the GAC, it will be used over the local registered dll. Normally this error happens when there is a trial dll in the GAC, as this has higher priority than the local dlls. 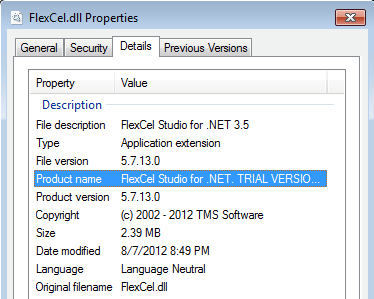 1) A registered FlexCel.dll. Trial might or might not work due to higher levels of code obfuscation. 2) A recent (2.10 or newer) Mono installation. 3) Gdiplus. This might or might not be installed with the default mono installation. Update to FlexCel 5.7 or newer. FlexCel used to use the classes in System.IO.Packaging to create xlsx files. When the generated xlsx file got too big (about 7mb), it would create a temporary file in the isolated storage. In version 5.7 we have rewritten the System.IO.Package classes in native C#, that doesn't use isolated storage at all, so you shouldn't get this error anymore. As a side advantage, the newer classes are faster since they write directly to the actual file, instead of writing a temp version to the isolated storage and then copying from the isolated storage to the real file.